Do you have a piece of furniture that has good bones but is in need of an update because the fabric is outdated or ruined? That’s what this ottoman is to us. We bought it over 10 years ago and it has good bones but the leather had worn, then cracked and finally started to be torn away by children. Do you know what I mean when I say “good bones?” I am talking about the solid structure of a piece that is quality made. It is a piece that continues to stand up to the rigors of its use. You can kind of see what it looked like before in this picture. Underneath the duct tape are holes from where a child tore away the leather that had cracked, then ripped. 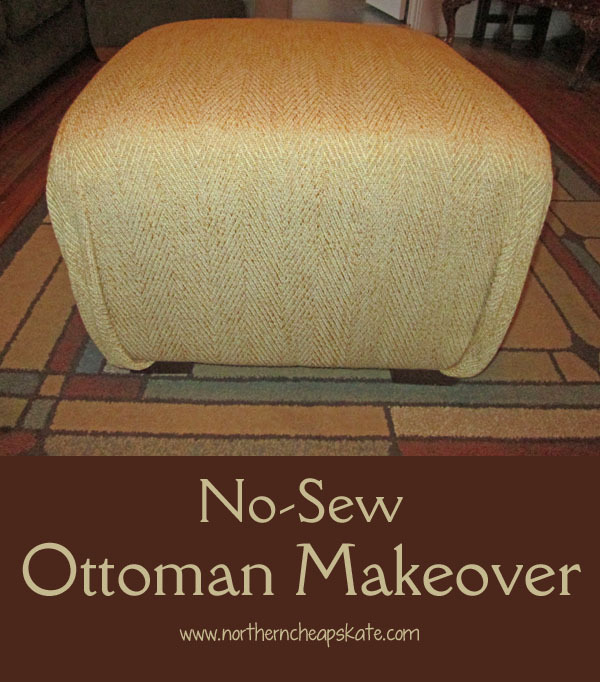 We tolerated the ugliness of the rip and hole for quite a while, but finally I couldn’t look at it anymore and we cast this ottoman to the playroom. I knew I wanted to give it a new look and cover but had not found the fabric I wanted at the price I was willing to pay, until I did. I found some upholstery fabric at JoAnn Fabrics. It was on clearance for $7 a yard (I needed two yards) and it just so happened I was able to use a 20% off entire purchase coupon on this as well, bringing it down to $5.60 a yard. 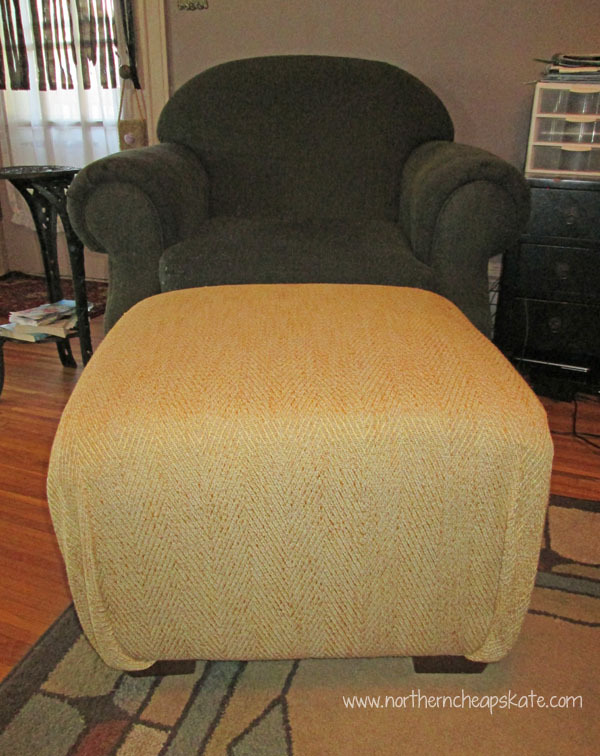 The fabric was all I needed to purchase so for around $12 I have what looks like a new ottoman! I had leftover batting so I covered the top of the ottoman with that and used the duct tape to secure it in place. 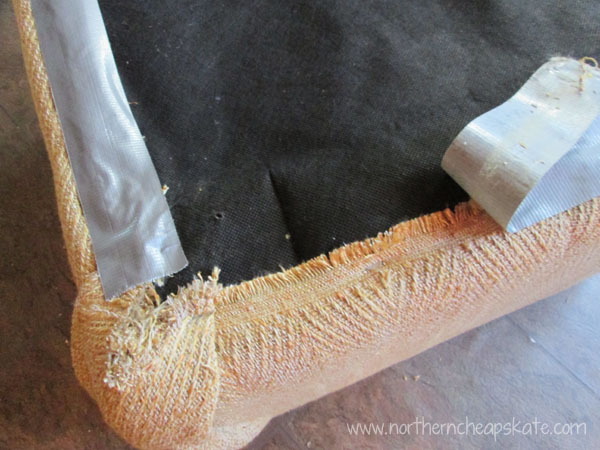 This helped provide a smooth surface on the top so that the bumps from replaced batting under the duct tape on the leather did not show and this way I could keep the leather intact and cover over the entire piece. Then I removed the feet on bottom. Originally, I thought I would try to make it have the look of 2 parts like it did previously and make a no-sew hem with the fabric glue, but very soon realized that would not work out as well. So, I stapled it all the the bottom. I started by working on opposing sides and putting in a few staples on each side to help pull it tight. Then I finished added staples so that there was about an 1”-1.5” of space between staples. Next it was time to do the same thing to the other opposing sides. What you will notice at this point is that you have this excess fabric in the corners that you need to do something with. I pulled the sides tight and stapled right at the edges on both sides of each of the corners. I could feel that there was about 4” of wood frame around the bottom than my staple could stick into. This helped bring the fabric in tight and then I pull the fabric straight to the bottom on each corner to create the pleats you see here. Next I just duct taped down all the edges so that this fabric wouldn’t fray and reattached the wooden feet at the bottom. I really like how it turned out and took me about an hour from start to finish to give it this update and cost me around $12. What a handy DIY project! Who needs to spend lots of money when you can create your own up-cycle of old furniture! Love the color! I’ve never tried fixing up an old furniture before. This is quite awesome! I love the after picture, it looks so brand new. Thanks for the tips! Amazing! This is gonna be so much fun, thank you for sharing smart idea. This looks so easy to do I will need to do this to update my furniture easy ? My mom loves to makeover anything! This one looks cool, I’m sure she would love it. That is so cool, i’m going to have to try it sometime on some of my own old stuff. Thanks so much for showing me this. Such a wonderful DIY work & I can see the output is really worthy for all the time & efforts you have put in to it. 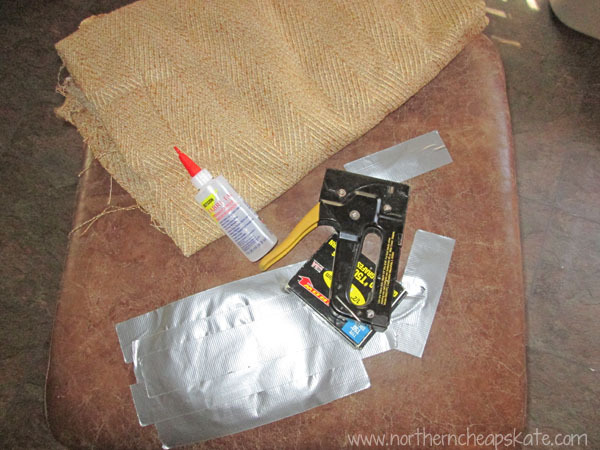 Fixing up an old furniture is always a big challenge & I think you have done it well with that great looking fabric.